NYKS Recruitment 2019 || HSLC to Postgraduate || Apply Online Now: Here is another Job in Assam by Neheru Yuva Kendra Sangathan. Apply for NYKS Recruitment 2019. if you are searching for a job in Assam. We will tell you all about this vacancy on this page. You may apply before the last date goes over. Hello friends, welcome to Jobinassam.in. I am Prashanta Paul and Here we discuss all the latest Govt. jobs, Private jobs, Company Jobs, Results, Academic information etc. Stay connected with us for all the latest information about Assam Career. You can Visit www.assam-results.com for any exam preparation, General Knowledge etc. Nehru Yuva Kendra Sangathan (NYKS) is an autonomous body of the Ministry of Youth Affairs & Sports, Government of India. It mobilizes youth through Youth Clubs and involves them in nation building activities and inculcate in them such values and skills that they become productive and responsible citizens of a modern, secular, democratic & technological India. 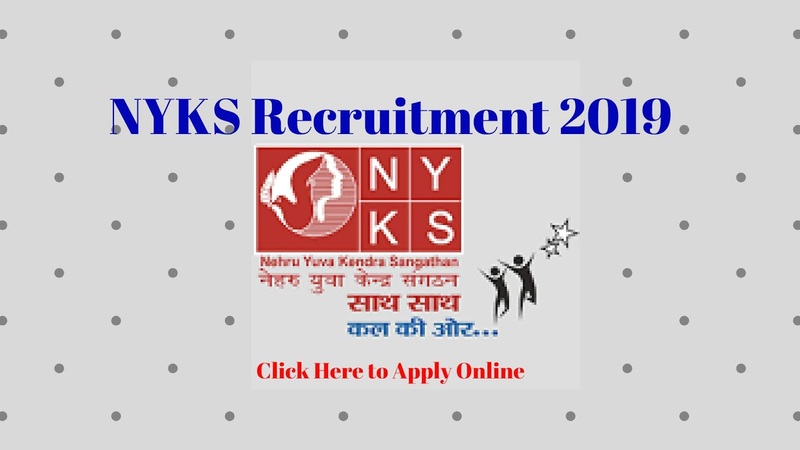 The Application Process of NYKS Recruitment 2019 is Online. Interested Eligible Candidates have to go through the official website of NYKS. The link is given below. Application Fee: The payment can be made by using Debit Cards, Credit Cards, Internet Banking, IMPS, Cash Cards/ Mobile Wallets etc. the application fee as follows. Essential: Post Graduate Degree in any discipline from a recognized University or equivalent. Desirable: Three years experience in Youth activities / Rural Development/ other social sectors including voluntary work in a reputed organization. 2. PG Degree of Rajiv Gandhi National Institute of Youth Development (RGNIYD) in various courses will be an added advantage. a) Worked as NSV/RSY/NYC for a minimum period of one year. Recruitment Process. ESIC may send intimation to download call letters for the Examination etc. email account and mobile number.